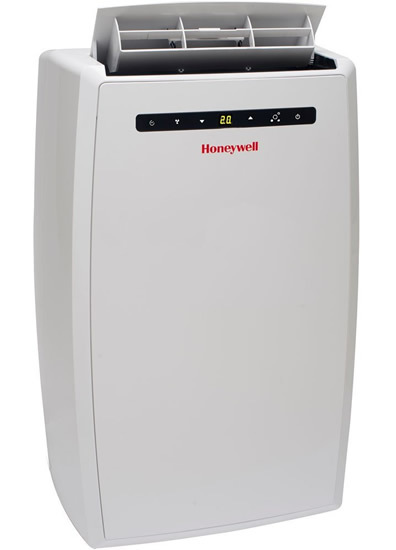 A popular way of providing a cooler indoor climate without paying for a large fixed installation is to buy one or more small portable air conditioners for room by room cooling. They have several advantages over fixed systems that I'll look at here in this part of the website that I want to dedicate to this alternative way to stay comfortable during the hot season. The obvious big attraction of these units is their portability, meaning a unit can easily be moved from one room to the next to cool only the space being occupied by a person or people. This also has a plus side in economical terms as it means you won't be wasting energy to keep one of more unoccupied rooms cool as can happen with an home-wide AC system. Moving a portable unit around is easy enough as they generally tend to be light enough for most folks to push them along on their wheels. The only snag is the trailing exhaust pipe or vent because it needs to be hooked up to a window venting kit of a custom wall vent and that means each room needs to be fitted with a suitable external venting aperture. For most folks, the simple solution is to just hang the vent hose out a slightly open window and block up the gap with cardboard or whatever is handy. Sure, it's not an ideal situation, but when it gets so hot you'll do almost anything to get some cooling relief, this is something that works just fine when there is no other alternative. Many people wonder why an AC needs to have an exhaust pipe at all. The answer is somewhat obvious when you think it through. All AC, including portables work by a refrigeration process that is similar to how your fridge keeps its contents cool. A big compressor is used to compress a refrigerant gas that takes the heat out of the air and chills it. The process uses a lot of energy to cool the air and it also produces a lot of heat that needs to go somewhere. With the fridge in your kitchen, because it only needs to cool a small, fixed volume (its interior) it only produces a relatively small amount of heat. That's not so much of a problem and just dissipates into the room, although in summer it can actually raise the temperature in the kitchen by a few degrees if there is no extractor working. But with an AC unit that needs to cool a much larger volume of air, the refrigeration process creates a lot of heat. If that heat were allowed to simply dissipate in the room you want to cool, you'd actually end up with a rise in temperature because the unit will create a larger amount of hot than cold air! So the heat needs to be allowed to vent to the outside so the room can benefit from the chilled air that lowers the ambient temperature to make it comfortable. What Are the Best Room AC Units to Buy? There are many good brands of portable AC on sale in stores and online, but choosing the best one for your personal needs can get a little tricky with the differing specifications that they advertise. Lucky for you, I can help you there! The main spec you need to get right is the cold air output measured in BTUs (British Thermal Units) which is a pretty standard measure of how much actual cooling a unit can achieve for its power rating. To find out how many BTUs you'd need to cool your space, you first need to measure the room, length by width to determine its square footage (length x width in feet = sq ft). Armed with that information, you're now ready to go hunting for the best buy at the stores. A friendly word of warning before you do that: Don't grab the cheapest model you can find. A cheap price tag can be a danger sign that is telling you that you're buying a cheap appliance that may not perform as well as a more expensive one. Or more importantly, it might not last anywhere near as long as a more expensive one. For many folks, buying cheap stuff is false economy when what you bought breaks down after a short time or it just doesn't do such a great job that you thought it should. Paying a little more can bring huge benefits, like longevity and faultless operation for its longer life span. I know folks that buy a really cheap appliance every year to replace the old one that stopped working. If they'd used their heads and paid maybe 50% more for a good model, they'd be getting great service from it for several years. That represents a big long term cost saving, except these folks can't see it that way. Well, each to their own, I guess!